While security stories often point to real threats, the narratives of leaders are as much about legitimating the power of rulers and the political and economic system that brought them to power. Derber and Magrass offer a penetrating examination of this phenomenon across history and types of societies. Their analysis reveals the great irony about security stories: they historically increase insecurity, imperiling citizens and nation. In the US today, the contradiction is especially acute, as security stories told by Trump divide US citizens against one another. The book builds from an analysis of the extreme dangers of the prevailing security stories to a new paradigm of true security. The authors develop new approaches as our best hope for avoiding catastrophe and creating a socially just society based on real security for a nation and for humans across the planet. A superb—and superbly readable—analysis of the way our ruling elites manufacture their own legitimacy and protect wealth and power. While deploring the rise of authoritarian nationalist movements of the Right, the authors do not shy away from criticizing the Left’s focus on identity politics of race and gender which has diverted attention from the fundamental requirement to tackle the injustices and irrationality caused by capitalism. Yet Derber and Magrass offer hope as they outline the growing moves by progressive Americans to build united fronts at the local and state level which are challenging the dominant narrative and bringing significant social and economic change and genuine security. Derber and Magrass provide a much-needed and optimistic antidote to Trump-inspired gloom. I love how Moving Beyond Fear weaves the metaphor of the upstairs/downstairs house throughout the book to paint an easy-to-understand picture of a capitalist-built house where the wealth produced by downstairs workers goes to a few upstairs residents living in luxury. Derber and Magrass show how the mortar holding this wobbly house together is fear and insecurity, and how the weaknesses of the left have failed to shake its foundation. Their solution? Read the book. A much more beautiful home in which we all thrive is awaiting. I just devoured this book. It’s hard to put down once you start it. Moving Beyond Fear exposes the playbook of authoritarian leaders, past and present. As the American Dream fades, political leaders use fear, fostering "security stories" to turn the lower classes against one another. This is a must-read for those eager to stem fascism and the looming catastrophes of climate change and nuclear proliferation. This book is just what’s needed. It explains lucidly and powerfully how fear is used from anti-immigrant nationalist politics throughout history into the Trump White House and right-wing radio today. 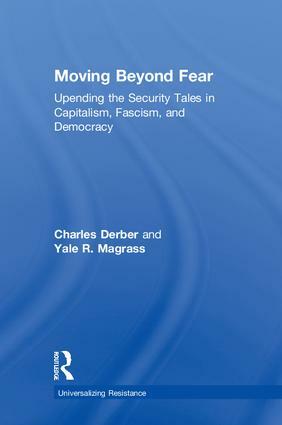 Derber and Magrass give us the analytical tools to understand the power of "security stories" and their role in legitimating the interests of authoritarian elites. Moving Beyond Fear is an engaging read to help us reject the politics and narratives of fear for an authentic security of greater equity, social injustice, and vibrant democracy. Derber and Magrass offer a timely critique of US national security policy. They show how successive US administrations have created false enemies to justify expansion of empire. They criticize both right-wing Republicans and the liberal Democrats who have failed to provide effective opposition. Their book is essential reading for anyone interested in national security issues. Why do people vote against their best interests? Why do many working people vote for their class enemy, a con artist who is dedicated slavishly to wealth and private power and is shafting them at every turn? The question is carefully addressed in this powerful study which explores a central part of the answer: the "security story" mixed with "raw tribalism," an amalgam with ancient vintage, commonly implemented in ways that gravely undermine security. Not for the first time in history—and as Mark Twain reminded us, while history doesn’t repeat, it rhymes. Sometimes ominously, sometimes with hope. Charles Derber is Professor of Sociology at Boston College. An internationally renowned scholar and public intellectual, he has written 21 books, translated into eight languages, and more than 100 articles, including op-eds for the New York Times, Boston Globe, Newsday, Truthout, and others. He appears frequently on national television and on radio programs, and is featured on hundreds of YouTube channels and other online sites. Yale R. Magrass is Chancellor Professor of Sociology/Anthropology at the University of Massachusetts—Dartmouth. He is the author of six books and over 60 articles, and frequently makes public appearances and presentations.